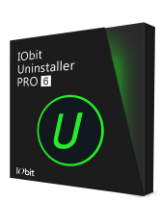 IObit Uninstaller Pro 6.0.2 was available as a giveaway on September 11, 2016! 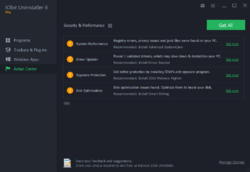 How would you improve IObit Uninstaller Pro 6.0.2? Any company that stealthily tries to install their other software on my PC gets uninstalled. In my books, its not being courteous to the subscriber. As for IObit, they have been on my radar for years. Thanks, but no thanks. Any company that stealthily tries to install their other software on my PC gets uninstalled. In my books, its not being courteous to the subscriber. As for IObit, they have been on my radar for years. Thanks, but no thanks. If GOTD offers a lifetime program, then there is no update possibility. This time there is as one-year license. And that means, that there are updates availible.. Therefore a complete working program. Nice software. Just uninstalled iobt Driver Booster with it. Worked like a charm. I have had bad experience with software from this company, like other people, particularly Advanced System Care, but I have rarely used this uninstaller much in the past. Today the uninstall malicious plugins thingy caught my attention because today I was struggly with a mail.ru trojan which 4 different antivirus and anti-malware programs didn't completely remove, it kept restoring malicious plugins to my browser. After using the uninstaller malicious plugins thing, I finally have found no more evidence of the trojan in my computer. Take it for what it is, I still don't trust the company, but today I have had a good experience with this software. I have had bad experience with software from this company, like other people, particularly Advanced System Care, but I have rarely used this uninstaller much in the past. Today the uninstall malicious plugins thingy caught my attention because today I was struggly with a mail.ru trojan which 4 different antivirus and anti-malware programs didn't completely remove, it kept restoring malicious plugins to my browser. After using the uninstaller malicious plugins thing, I finally have found no more evidence of the trojan in my computer. Take it for what it is, I still don't trust the company, but today I have had a good experience with this software. I want IObit Uninstaller without that UninstallMonitor.exe that I have found no value for and that is undetected by Autoruns and WinPatrol and any autostart monitor that could disable it. Maybe portable is the only way? i suppose you can only have the free version portable. I've never had an issue with any IObit apps. Quite the contrary, their Advanced System Care has saved my various PCs over the years. When I worked for AT&T's DSL support, I recommended these products many a time to my customers. I've never had an issue with any IObit apps. Quite the contrary, their Advanced System Care has saved my various PCs over the years. When I worked for AT&T's DSL support, I recommended these products many a time to my customers. Thank you so much for this great program. Thank you for all the free software, that you provide!! I wonder if you can use this crummy IObit uninstaller to uninstall all the other crummy IObit junk they install behind your back. Iobit is spammy with their own adds and have been known to alert to competitors, etc. I do NOT recommend for 1 year then out. Loan of the day here. Good luck if you install this one. Iobit is spammy with their own adds and have been known to alert to competitors, etc. I do NOT recommend for 1 year then out. Loan of the day here. I like the Wisecare products much better and Kerish Doctor as well... Good luck if you install this one. I have enjoyed giveawayoftheday for years...the software is great and occasionally so good I purchase it. The problem I have is the initial sharing on social media...I disable ad blocking and pop-up blocker for this domain...yet it will not allow me to share...I have to do the email link, upon receiving and at the last window, I am able to finally share on Facebook. If anyone has a clue to how I can initially share, I would appreciate it...I utilize the updated version of FireFox, I have quad 4.2 GHz CPUs and 16 GB of installed RAM, running Windows 7.x1 Home Premium. I would appreciate some input. An hour after downloading and installing this program, my anti-malware software picked up that the downloaded setup.exe inside the zip file was infected with a PUP,(Potentially Unwanted Program) called Win32.Gen.vb. Apparently this is looked upon as a WORM and can spread if undetected. Advise installers to do a virus scan after installation or avoid it altogether. An hour after downloading and installing this program, my anti-malware software picked up that the downloaded setup.exe inside the zip file was infected with a PUP,(Potentially Unwanted Program) called Win32.Gen.vb. Apparently this is looked upon as a WORM and can spread if undetected. Advise installers to do a virus scan after installation or avoid it altogether. Installed this in ten minutes. Posted to FB. The License is for a year! Been using previous versions for years! It works better than some and worse than others! I have tried the others mentioned here in the past! Vote for Hillary and she will send some thug over to help! LOL Thanks and have a great day! Gotta Love It! Installed this in ten minutes. Posted to FB. The License is for a year! Been using previous versions for years! It works better than some and worse than others! I have tried the others mentioned here in the past! Vote for Hillary and she will send some thug over to help! LOL Thanks and have a great day! I used to use Revo exclusively but it was only designed for 32 bit systems so I started using geek uninstaller which worked very well. Recently Revo has since upgraded to being compatible with 64 bit systems so I have reverted back to that. In the meantime I had downloaded and installed IObit Version 5 and would use that from time to time. All three of these applications, all free versions, have worked fine for me. I'm not really a Techie so I could be missing something important but they all seem to work about the same to me. I installed today's offering from IObit and the only thing is that It doesn't show that it is the pro version. Since it's free I guess I can't be too picky though. It automatically uninstalled the previous version during installation. license 1 year? Thanks. Trial not for me! A one year license is not a "GIVEAWAY of the Day". It's a "LOANAWAY of the Day". "Give" is defined as "freely transfer the possession of (something) to (someone); hand over to". A one year license is not a "GIVEAWAY of the Day". It's a "LOANAWAY of the Day". "Give" is defined as "freely transfer the possession of (something) to (someone); hand over to". Mike H, You should check the websites of a few software companies. You will see that they are leasing their software for one, two or three years. Only a few times it's for life, and you pay a good deal for it. and didn't recall installing it. You're absolutely right about that. The only Iobit application I trust is their unlocker program. I use RevoUninstaller Pro and Regseeker (for advanced users only) to take care of the leftover remnants in the registry. kstavert, You're absolutely right about that. The only Iobit application I trust is their unlocker program. I use RevoUninstaller Pro and Regseeker (for advanced users only) to take care of the leftover remnants in the registry. IObit? Run for the hills..
Richard, I have had the same experience. The devious squirelly invasion of the system must be intentional. The problems that were described had nothing to do with the operation of the uninstaller. What they were talking about was the additional software that was installed along with the uninstaller. Personally I will stick with the portable version. It may not be as up to date as this version but it's much more safer. Peter v Rijswijk, The problems that were described had nothing to do with the operation of the uninstaller. What they were talking about was the additional software that was installed along with the uninstaller. Personally I will stick with the portable version. It may not be as up to date as this version but it's much more safer. Have tried it years ago, but uninstalled again as it harmed my computer. The only harm done was by you because this program makes you verify and elect to delete anything unless you tell it to or set a setting to it's non default state. Don't blame this application for your ignorance. I have used IObit Uninstaller both paid and free for over 4 years now and yes it does sometimes find wrong files or registry entries with powerful scan but I always correct it when it does and it only does that about 1-2% of the time and it's typically something like Synaptic Touchpad and Fingerprint sensor drivers (related but separate things that are installed in same top level directories). I recommend folks who get this just be aware that if you can do harm to your system if you are not careful and understand what you are doing so when in doubt just leave it up to the app's own uninstaller if you are not 100% sure. Many folks don't know this but this program actually has a background service (UninstallMonitor.exe) that watches during installs on your system so it does a pretty good job of getting residual files some sloppy uninstallers miss. Thanks GOTD and IObit - even if the Pro is only good for 1 year (really? why keep doing that) the next version will be out by then and it will show up again on GOTD anyway. You admit that the program sometimes delete the wrong files and registry keys. It is unacceptable for me - I will not play French roulette with my computer. So I'll just refer to the next post #25 (Never again). May you have a nice day! J H, You admit that the program sometimes delete the wrong files and registry keys. It is unacceptable for me - I will not play French roulette with my computer. So I'll just refer to the next post #25 (Never again). May you have a nice day! The ReadMe txt says "!!! .GCD file included is necessary for correct installation and activation" but there is no .GCD file in the extracted Zip file. ChrisK, Truly lousy instructions to be sure, but it installs just fine without it. I have tried downloading several times, but am not receiving a .gcd file. Setup installs version 6, and when you try to activate, it asks you for an additional fee to get the pro version. Hi fugawibill. :-) Users reported problems with these antiviruses, in past months/years: avast, avg, Kaspersky, Norton. If you have one of those AV, you could try these possible solutions: 1) put the setup.exe in the whitelist of your antivirus 2) disable the real-time/on-access scanning, just the time to download/install the software (then re-enable that function) 3) disable your AV completely, just the time to download/install the software (then re-enable it) 4) boot windows in safe mode with networking, just the time to download/install the software Hope this helps. 3 times have sent my e-mail address and not once has a link to download been sent. waste of time. I know it shouldn't be there, but who knows: did you also check the spam folder? Hi myhardbody@yahoo.com I know it shouldn't be there, but who knows: did you also check the spam folder? I already had the free version installed, so upgrading was just a matter of plugging in the the registration number. I love the free version, so I'm fine with an "extended trial." Many thanks to IObit and GTOD for the chance to try out the software's bells and whistles over time. Convenient, BUT now what happens a year from today? Klacey, Convenient, BUT now what happens a year from today? Downloaded/installed no hassles. This altered my control panel and put itself there, and also embedded itself deep in the registry, Be careful with installing, as it can attempt to install extraneous other 'free'ware, which, if installed by accident, will give pop ups for upgrades (at cost) for those items. After trying it, I found uninstall leftovers of the deleted progs in app data roaming, and the registry. Uninstalled. I'll stick with Geek uninstaller, which is free, efficient,and leaves a VERY small footprint. Thanks but no thanks, I'm uninstalling. Yes, and the hell get bigger with each version of the OS, I'll stick with XP thank you. McGregor, yes XP is the best until now! Lots of people compare it with other software and judge it according to their findings, however, if you need feature like hunting mode, REVO is above all. I have software that IObit did not remove 100% and left over tiny bits in the registry here and there, furthermore, you need software that searches the registry in every compartment for left over and the best for that is soft organizer. I had IObit before, but I had to run registry cleaner after that. If you have to restart your computer to remove the rest of the software, something is left behind, because real mode is disabled and or some drivers are loaded for that software to run on start up or some registries are made read only. No software can trace all of the entries in the registry and remove them all. Some are very simple to remove, because they have couple of entries only, some have thousand of entries and every time you start that particular software, more entries are added. Some software use the registry as log file and those programs are known for creating computer malfunctions, one of those software is IObit. Lots of people compare it with other software and judge it according to their findings, however, if you need feature like hunting mode, REVO is above all. I have software that IObit did not remove 100% and left over tiny bits in the registry here and there, furthermore, you need software that searches the registry in every compartment for left over and the best for that is soft organizer. I had IObit before, but I had to run registry cleaner after that. If you have to restart your computer to remove the rest of the software, something is left behind, because real mode is disabled and or some drivers are loaded for that software to run on start up or some registries are made read only. No software can trace all of the entries in the registry and remove them all. Some are very simple to remove, because they have couple of entries only, some have thousand of entries and every time you start that particular software, more entries are added. Some software use the registry as log file and those programs are known for creating computer malfunctions, one of those software is IObit. "No software can trace all of the entries in the registry and remove them all." Have almost given up on this site what with their addiction to the social media crap necessary for a simple download but bit the bullet and got this file. You don't have to post to Facebook, just say you will. When the box pops up click cancel & then Leave this page. After the window closes The main box will change to Download automaticallly! you can also choose to have the Download link emailed to you. It's really no big deal! Download & enjoy! I post to facebook to let people know the can get really good games for free here. I fell it's the least I can do for great games & Programs that I'm getting for free! WGS, You don't have to post to Facebook, just say you will. When the box pops up click cancel & then Leave this page. After the window closes The main box will change to Download automaticallly! you can also choose to have the Download link emailed to you. It's really no big deal! Download & enjoy! I post to facebook to let people know the can get really good games for free here. I fell it's the least I can do for great games & Programs that I'm getting for free! Entirely agree and would also wish for downloads to install without having to disable antivirus (protection). WGS, Entirely agree and would also wish for downloads to install without having to disable antivirus (protection). Simple install without any fuzz (code copypasta). Clean interface. It "sees" more program than the Windows unistaller, and it also allows you to uninstall both Windows and 3rd party apps, and toolbars/addons. It tries to add a couple of items to your Windows boot, that I blocked with Anvir without any issues. I own a license for Revo Pro so this isin't for me, but I encourage everybody who doesn't have a license for a similar product to give this a try. Even with logging installs, I still have a few items around needing CC to clean up. The OEM uninstalller seems to leave as much behind as it takes away. I have no license to enter. My version of this product simply states that it's free but without a license number I can't upgrade. Can anybody help me with this? Read the readme.txt present in the downloaded package. You can find the instructions on how to activate the software there. Hi James. :-) Read the <b>readme.txt</b> present in the downloaded package. You can find the instructions on how to activate the software there. Hope this helps. I dont understad,10bit unistaller free do the job perfectly.What's more in pro endition? Hi Stavros. :-) Check the comparison on their website: http://www.iobit.com/en/advanceduninstallerpro.php - Larger Real-time Database to Uninstall More Stubborn Programs - Uninstall Malicious plug-ins for more secure browser - Cleaner & Faster Online Experience with Adware Removal - Auto Clean Leftovers of Programs Uninstalled by Other Uninstallers - Automatically Update to the Latest Version - Free 7/24 Technical Support on Demand - The price Hope this helps. I would strongly suggest everyone opts for the Custom Install and watches for checkboxes as well. If you see a Decline button, make sure to press that button. bruce, I would strongly suggest everyone opts for the Custom Install and watches for checkboxes as well. If you see a Decline button, make sure to press that button. If it is so easy to remove it with Windows uninstaller, why not stay with Microsoft's uninstaller?? Arnold Knack, I can tell that you are new at uninstalling. That is okay. The Windows uninstaller does little more than run a program' s built-in uninstall routine. Unless a developer is diligent in writing his program' s uninstall application, a number of registry entries are left on your computer as well is often times many directories and files. Programs like Revo Uninstall run the program' s uninstall routine then scan the registry of a computer for left over registry entries and scan the hard drive for left over directories and files. This provides a much more complete uninstall. Some uninstall programs use to install programs as well as uninstall them. When you started the installation of a program the uninstall program used to take a snapshot of a hard drive and registry before installing the program and then take another snapshot after the program's installation was complete. Using this method used to take a very long time to install a program. The better newer programs scan a computer like I mentioned above. Many computer veterans prefer using Revo and similar programs over the Windows uninstall program to more completely remove a program when you uninstall it. Arnold Knack, I can tell that you are new at uninstalling. That is okay. The Windows uninstaller does little more than run a program' s built-in uninstall routine. Unless a developer is diligent in writing his program' s uninstall application, a number of registry entries are left on your computer as well is often times many directories and files. Programs like Revo Uninstall run the program' s uninstall routine then scan the registry of a computer for left over registry entries and scan the hard drive for left over directories and files. This provides a much more complete uninstall. Some uninstall programs use to install programs as well as uninstall them. When you started the installation of a program the uninstall program used to take a snapshot of a hard drive and registry before installing the program and then take another snapshot after the program's installation was complete. Using this method used to take a very long time to install a program. The better newer programs scan a computer like I mentioned above. Many computer veterans prefer using Revo and similar programs over the Windows uninstall program to more completely remove a program when you uninstall it. kc4cop, I forgot to mention that some of the newer uninstall programs, and I think IObit is included in this group, query a database that contains a complete uninstall routine for those programs included in the database. Unless this type of program is updated frequently many programs are never included in the database. 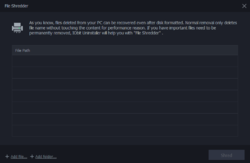 I've been using IObit Uninstaller for some time now, and in my opinion it a much better product than Revo Uninstaller because it has some very useful features that Revo lacks. It has a batch uninstall mode which lets you uninstall as many programs as you want, one after the other. For people like myself who are continually trying our new software, this is really handy. Also, it's very useful when you want to clean out a lot of unwanted software from a computer. It's much more convenient than having to manually uninstall each program one by one. The batch uninstall mode, uninstalls each program one by one and then scans for leftovers for every program removed in one go. Another important feature, is that is can can continue where it left off after restarting Windows. So, you can restart Windows after uninstalling a program if you asked to, and then when Windows loads again, you are given the option to launch IObit Uninstaller again and scan for leftovers. Revo and other uninstallers can't do this. 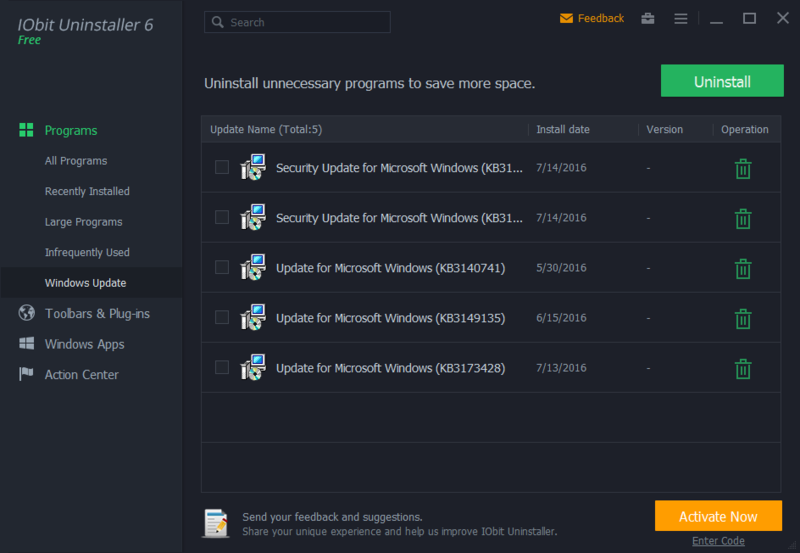 If you are uninstalling multiple programs, IObit Uninstaller will continue uninstalling any remaining programs after a reboot, and then will scan for leftovers for every program uninstalled. Finally, it can uninstall the new Windows apps in Windows 8, 8.1 and 10. this is handy as Microsoft includes some apps you may not have a use for in Windows 10. Also, it's possible to remove any apps you don't want and scan for leftovers in one go. Another plus for IObit is that is regularly updated. On the other hand it took more than three years for Revo to release the latest update for the free version of their uninstaller. Although you are only getting a 1 year license, after the 12 months is up, IObit Uninstaller will revert to the free version, so you will still be able to use it. The free version has less features, but does just a good a job as scanning for leftovers as the Pro version, and is updated just as often. 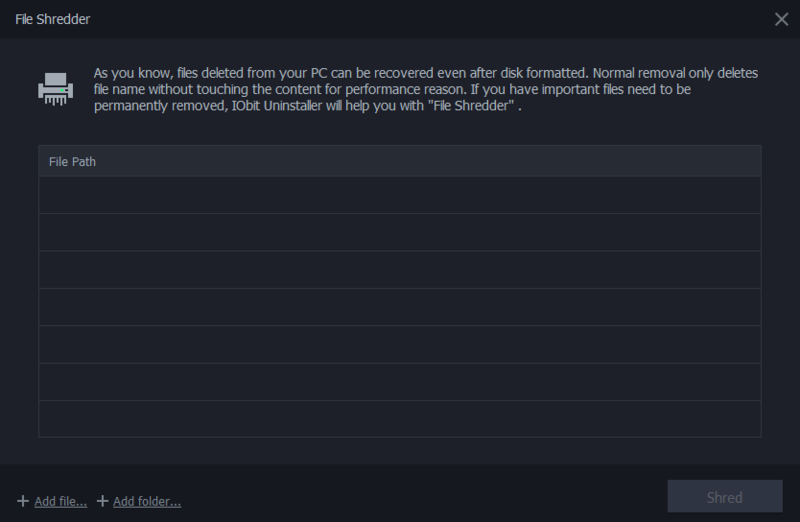 I've been using IObit Uninstaller for some time now, and in my opinion it a much better product than Revo Uninstaller because it has some very useful features that Revo lacks. It has a batch uninstall mode which lets you uninstall as many programs as you want, one after the other. For people like myself who are continually trying our new software, this is really handy. Also, it's very useful when you want to clean out a lot of unwanted software from a computer. It's much more convenient than having to manually uninstall each program one by one. The batch uninstall mode, uninstalls each program one by one and then scans for leftovers for every program removed in one go. Another important feature, is that is can can continue where it left off after restarting Windows. So, you can restart Windows after uninstalling a program if you asked to, and then when Windows loads again, you are given the option to launch IObit Uninstaller again and scan for leftovers. Revo and other uninstallers can't do this. 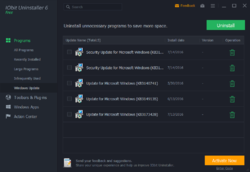 If you are uninstalling multiple programs, IObit Uninstaller will continue uninstalling any remaining programs after a reboot, and then will scan for leftovers for every program uninstalled. Finally, it can uninstall the new Windows apps in Windows 8, 8.1 and 10. this is handy as Microsoft includes some apps you may not have a use for in Windows 10. Also, it's possible to remove any apps you don't want and scan for leftovers in one go. Another plus for IObit is that is regularly updated. On the other hand it took more than three years for Revo to release the latest update for the free version of their uninstaller. Although you are only getting a 1 year license, after the 12 months is up, IObit Uninstaller will revert to the free version, so you will still be able to use it. The free version has less features, but does just a good a job as scanning for leftovers as the Pro version, and is updated just as often. Roger has three posts so far in this thread, all of them boosting Iobit. Sounds like you work for the company. If so, you should come out and say so. Bruce Fraser, I'm self employed. I don't work for IObit or any other company. I just like their products. It's not right to make comparisons between free version of a software and a paid version of another one. Revo uninstaller pro has got about the same features. And also Smarty uninstaller and Chemtable Soft Organizer. Geek Uninstaller has got only the "batch mode", but that's freeware; its pro version, crystalidea uninstaller tool, has got the same functionalities of the other programs. These were only examples, there could be other software that does the same things: just search it on the web. I personally prefer windows "uninstall or change a program". xilolee, I've used just about every uninstaller there is. Pretty much all of them often do a poor job of searching for leftovers compared to IObit/Revo, with the notable of exception of Geek Uninstaller/Uninstall Tool, which do a comparable job. The batch uninstall mode in Uninstall Tool, is very limited compared to the one IObit Uninstaller uses, as it does not actually uninstall software before scanning for leftovers. One big advantage that IObut Uninstaller has over others, is that it can scan for leftovers after a reboot. Crystal Idea even say that one of the reasons they don't offer a proper batch removal tool in Uninstall Tool is that it can't scan for leftovers after a reboot. xilolee, I've used just about every uninstaller there is. Pretty much all of them often do a poor job of searching for leftovers compared to IObit/Revo, with the notable of exception of Geek Uninstaller/Uninstall Tool, which do a comparable job. The batch uninstall mode in Uninstall Tool, is very limited compared to the one IObit Uninstaller uses, as it does not actually uninstall software before scanning for leftovers. One big advantage that IObut Uninstaller has over others, is that it can scan for leftovers after a reboot. Crystal Idea even say that one of the reasons they don't offer a proper batch removal tool in Uninstall Tool is that it can't scan for leftovers after a reboot. I agree 100% with ototo. For a year or so now I've run IObit side by side with Revo uninstaller. Revo is the better of the 2 products. Revo Uninstaller Pro - you don't need more. ototo, How about Geek uninstaller ? I don't know, never used it. It's hard to judge an application without trying it and even afterwards. We don't know which is better than others, because we can't say which one can delete all leftovers and which one can't. Even if you install this or another you can't be sure which is the best. @A. Geezer I don't know, never used it. It's hard to judge an application without trying it and even afterwards. We don't know which is better than others, because we can't say which one can delete all leftovers and which one can't. Even if you install this or another you can't be sure which is the best. I used it for a while. It did what it supposed to do, but it also installed something called Live Update, in my start up menu. I kept disabling it, but whenever I used the uninstaller, the other crap was in my startup menu again. So I uninstalled the uninstaller, and the Live Update was still on my computer. It took awhile to get that garbage off of my computer. I've used this before and found it to be very good. However, I stopped using it because IObit have a nasty habit of nagging you to install their other products and installing things like Advanced System Care and Driver Booster even when you decline them. Thanks but I'll pass on todays download. This is the brand I use all the time! Oh no one year license again. Bob, wat is het dan wel? Bob, you are so right! A long time ago, I paid iobit for Advanced System Care and because of that I won't install this because of all the NAGGING from iobit and you can never really get the s. . t out of you HD either. Paul, it's really easy to remove any of their products. You can do so from Add/Remove Programs or Programs and Features. I do it all the time, with no problems. Paul, it's really easy to remove any of their products. You can do so from Add/Remove Programs or Programs and Features. I do it all the time, with no problems. Bob, considering that IObit's products are regularly available as giveaways, I'm sure there will be another 12 month giveaway of IObit Uninstaller before the 12 months is up. IObit like many others try to expand business. Also, at least some do, is monitoring comments here via this platform. All this for the purpose of improving there software and making it perform even better for all of us. Do you believe any this? I don't either but there certainly are contributors here that on a regular basis "give away" their upgraded versions with a new licence. (For free that is) Now that is what I would call extended licensing. Whatever did happen to Karl? lidl1, Whatever did happen to Karl? scruff, yeah, that sounds about right. Seems like every time you get some decent posters they get harassed by a few jerks and then they're gone, ie: Ashraff, Mike, etc. Dunno DEXIT perhaps? I remember he wrote that he had the intention to leave this platform for a long time view all comments and remarks he had to deal with and so he finally did. Evgeny, Even if you purchase the product it is a 1 year licence (for 3 machines) so in this case it is in keeping with the commercial aspects of the licence. Craig, why not go back to a past giveaway years ago when he posted and post a reply to his comment (a facility that was not available back then) and if he still has the same email he used when submitting comments and your reply passes moderation he may get notification of your reply to his comment! I agree with lidl1s sentiments about IOBit nagware and because of other previous less than honourable buisness practices.I won't have their software on any of my systems.